Viknesh Vijayenthiran March 3, 2015 Comment Now! 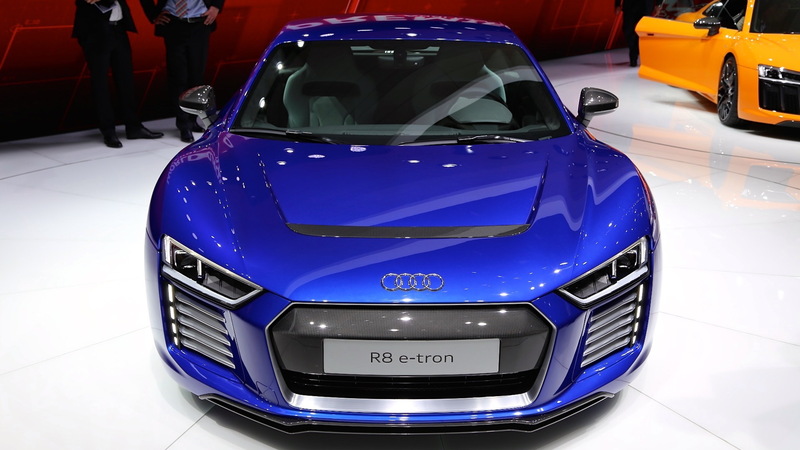 Audi’s new R8 supercar makes its official debut this week at the 2015 Geneva Motor Show, and to help kick off the launch Audi is showing four distinct versions of the car. Two of these we’ve already seen, the V-10 powered R8 V10 and R8 V10 Plus. The remaining two are the R8 LMS race car and R8 e-tron battery-powered model, the latter of which is featured here. 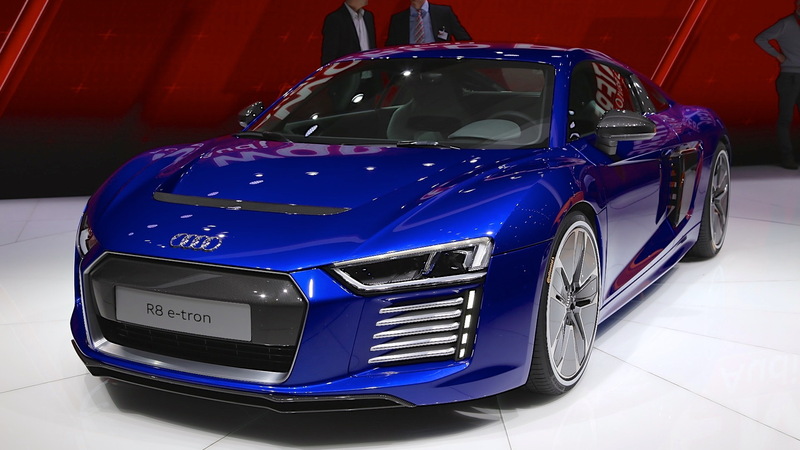 The R8 e-tron was first hinted at as far back as 2009, when Audi rolled out its first concept version of the car. Production was quickly confirmed but a poor business case and lack of suitable technology meant the project was put on hold. 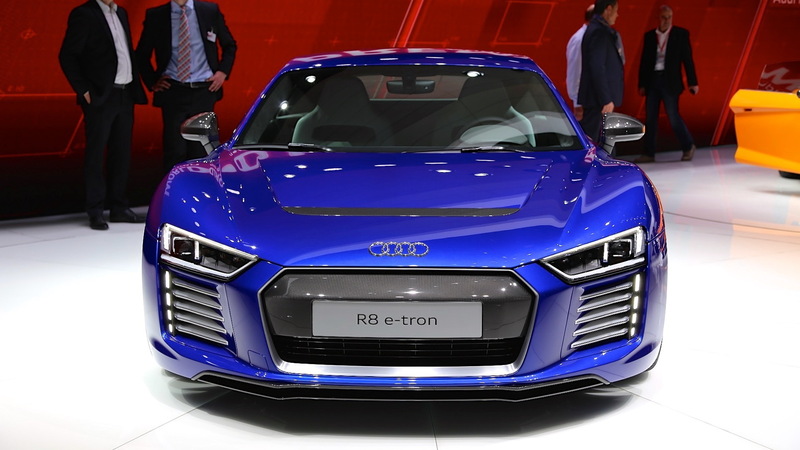 Audi eventually made the confirmation in early 2014 that an electric version of its second-generation R8 would be built and sold to the public. Now, with the arrival of the second-generation R8, Audi has stuck to its word. 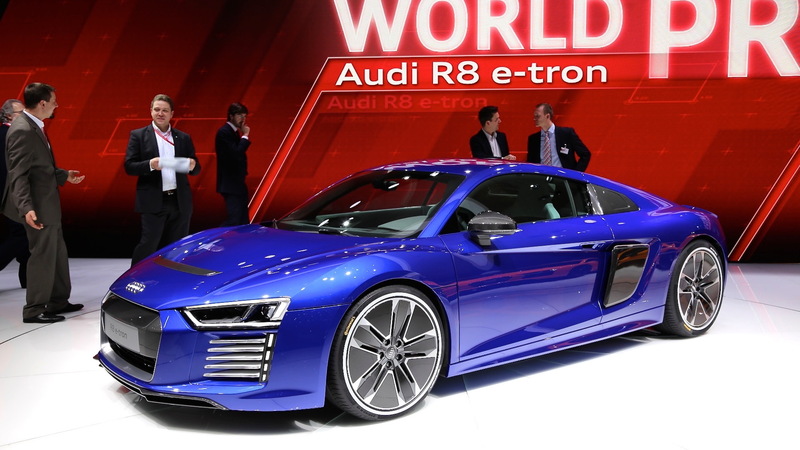 A U.S. launch for the new R8 e-tron hasn’t been mentioned (in other markets it will be available to order this year) but many of the car’s specs have now been confirmed. The car features a large T-shaped lithium-ion battery, structurally integrated into the center tunnel and behind the occupant cell. The battery has a 92-kWh capacity and should deliver a driving range of about 280 miles. Using a DC fast-charger, Audi says the battery can be fully charged in less than two hours. To offset the weight of the battery, the engineers used even more carbon fiber in the R8 e-tron’s construction compared to the standard R8. The basic supporting structure was enhanced by a carbon fiber-reinforced plastic rear-section module comprising the luggage compartment, with the material corrugated to ensure extra strength. Joining the weight-saving mods are some aerodynamic enhancements, made to both the body and wheels. Audi says these help the vehicle’s drag coefficient (cd) value coming in at a super-slippery 0.28. Peak output is said to be around 456 horsepower and 678 pound-feet of torque from a pair of electric motors at the rear of the car. Drive is to the rear wheels only for efficiency reasons, and Audi says the car should accelerate from 0-62 mph in just 3.9 seconds. Top speed can be limited to either 130 or 155 mph. For handling, targeted torque vectoring is available. Audi is calling the car primarily a rolling laboratory for "help in creating a vehicle with sedan character," suggesting we could see its hardware end up in a more conventional model from Audi designed to rival the likes of Tesla Motors’ [NSDQ:TSLA] Model S—something that has been speculated in the past. Pricing and availability details for the R8 e-tron will be announced at a later date. For more from the Geneva Motor Show, head to our dedicated show hub.